The Clan Stuart was built in 1900; this triple expansion steam engine ship was built by W. Doxford and Son, Sunderland, England. The ship was not designed to withstand weather even though it was freight-only ship; instead the ship was designed to overcome the restrictions of the Suez Canal since ships were charged tax fees depending on the breadth of the beam. Therefore the Clan Stuart vessel was designed with a hull that bulged out below the waterline and with only a narrow portion of the vessel visible above water. The design might have saved on tax fees however the design came with heavy draw backs. It caused the ship to roll badly in heavy swells and pilots boarding or leaving the ship during poor weather condition experienced serious difficulties. There are three different versions of how the Clan Stuart arrived in South African waters; the first version says she arrived at Simon’s Town from St. Helena to deliver her consignment of coal to Wales, while the second version says she arrived after providing coal to the Astraea. The later version states that she was on a naval requisition order after a coal delivery to St. Helena. These three versions have only one common fact and that is the Clan Stuart arrived in Simon’s Bay because of a coal delivery. On her arrival she was “near-light” hence almost empty. The Clan Stuart was anchored in the Bay. At 2am on 21 November 1914 a south-Easter gale force wind caught her off guard resulting in her been dragged and eventually she ran hard aground, dragging her anchor as she was pulled on the rocks near Glencairn beach. Her cargo was saved and the crew were rescued by lifeline. The tug, Ludwig Wiener pulled her off the rocks and towed her back to Simon’s Town dry docks for repairs. However she was refused permission to enter until further repairs because of danger of her foundering in the approach-channel. Therefore she was run ashore on Mackerel Beach just 100 meters from the sandy beach, and she was linked to the beach via a cable. Two anchors were used to keep her steady and prevent her from sinking. Captain Burns of Glasgow Salvage Company sent divers in to inspect the Clan Stuart and reported that she was salvable, however repairs would be costly .The repair work was given the go ahead but all efforts were futile. As a last resort, a wooden coffer dam was built around the damaged plates. However, this collapsed when the ship was refloated and the engine room was flooded. All that remains now is the wreck beneath the waves on Mackerel Beach. The engine block can be seen from above the water; her deckhouse was removed and taken to the Glencairn Hotel. In 2004 the area in which the Clan Stuart lies become protected marine area hence a permit is required for any work or studies to be carried out on the site. That being said there is still a great deal of interest in the shipwreck from local divers including a voluntary research project. 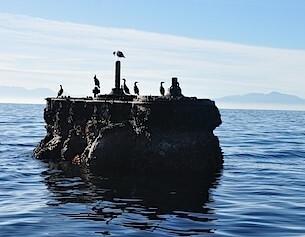 She may not have fought directly in the WWI but she fought her own battles against the sea and will never be forgotten as her engine above the water at Mackerel Beach, Simon’s Town providing a constant reminder.